A pimple is not always a pimple, especially when it can develop into one of the world’s most serious, and deadly, antibiotic-resistant bacteria. The methicillin-resistant staphylococcus aureus infection, known as MRSA, has been referred to a superbug due to its resilience against powerful antibiotics. We will examine how the MRSA infection develops, spreads, and if there are precautions we can take to avoid becoming affected by this scary invader. The MRSA infection can be broken into two specific types. Hospital-associated MRSA affects those involved in the healthcare setting such as doctors, nurses, hospital staff, and patients. Community-associated MRSA refers to infections occurring within groups of people having skin-to-skin contact, specifically athletes. The United States has more than 90,000 cases of MRSA infections diagnosed every year with nearly 19,000 of those cases resulting in death. Of all of the cases, 86% are hospital-associated. So, how is this major infection able to be spread so easily in an environment that promotes cleanliness and better health? A staph bacterium is the reason behind the MRSA infection. Most types are not cause for concern as up to one-third of all humans carry a form of staph bacteria in their noses and are not affected by it. There are ones that can be life-threatening, and those are the ones that have the medical world very concerned. It is these infections that resist modern antibiotics. Hospital-associated MRSA infections can occur during surgery, routine blood tests, and intravenous applications. Basically, any type of invasive procedure can act as a catalyst agent for infection. These are typically seen in hospitals, clinics, nursing homes, and other health care centers. Those at highest risk for hospital-associated infections are patients with open wounds, weak immune systems, surgical patients, and those with medical devices such as a catheter and intravenous drip. Community-associated MRSA infections are common among sports team players, child care workers, and within close living quarters. This infection may present as a skin boil in the early stages. A painful infection, community-associated conditions are highly contagious and can be easily spread by skin-to-skin contact. 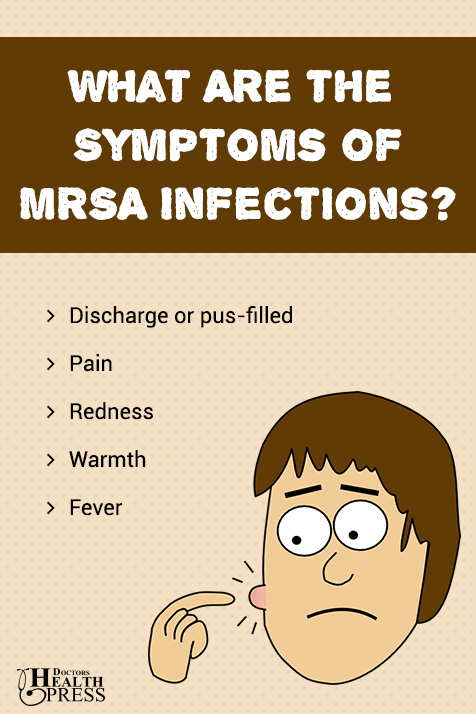 What Are the Symptoms of MRSA Infections? Hospital-associated MRSA infections have a specific protocol to be followed by all those within a hospital or health care center including patients, visitors, doctors, nurses, therapists, and cleaning staff. This includes the following steps to prevent the spread of the infection. Hands must be thoroughly washed with warm water and soap or a hand sanitizer with an alcohol-base before visiting each patient. Each piece of equipment within the hospital, including each room, must be cleaned with professional standards in mind. Each hospital setting has a cleaning protocol to follow. MRSA-infected patients must be separated from other hospital patients. These patients will also be asked to remain in their room when not having tests. All people entering a room of a MRSA-infected patient will wear a gown and gloves while in contact with the patient. These items will be properly disposed of after exiting said room and hands are to be washed. Use warm water and soap to frequently wash hands. Scrub for at least 15 seconds and use a disposable towel to dry and another one to turn off facet. Always carry an alcohol-based hand sanitizer for times you have no access to soap and water. Keep nails short to avoid collection of germs under the nailbed. Cover all cuts, scratches, and wounds covered with a sterilized gauze or bandage. Do not share personal items such as towels, bedding, clothes, athletic equipment, soaps, and lotions. Athletes should always shower after each workout, practice, or game. Use hot water and detergent to wash clothing and bedding, especially if you have been in contact with an infected person or have had the MRSA infection. 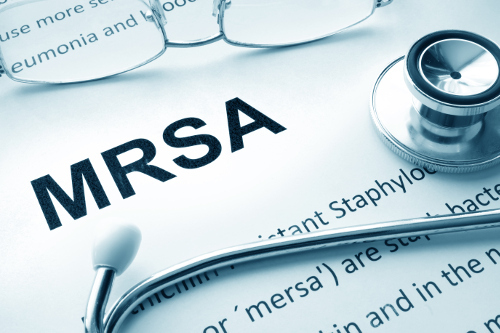 A MRSA infection can be a difficult infection to combat due to its drug-resistant defense and the fact it is easily spread in a hospital or community setting. It can first present itself as a small bump or pimple and is usually accompanied by symptoms that can mimic other health conditions. Common sense is the best prevention of spreading the infection as maintaining good personal and environmental hygiene is key. Those within the hospital setting must take extreme precautions to avoid spreading the infection from patient to patient. Akpan, N., “New Antibiotic for Deadly MRSA Infections Found Right Under Our Nose”, PBS Newshour, July 27, 2016; http://www.pbs.org/newshour/rundown/new-antibiotic-deadly-mrsa-infections-found-right-noses/, last accessed February 15, 2017. “MRSA Infection”, Medline Plus; https://medlineplus.gov/mrsa.html, last accessed February 15, 2017. Nichols, H., “MRSA: Treatment and Prevention,” Medical News Today, October 19, 2015; http://www.medicalnewstoday.com/articles/10634.php?page=3, last accessed February 15, 2017. Gonzalez Gompf, S., “MRSA,” Medicinenet; http://www.medicinenet.com/mrsa_infection/article.htm, last accessed March 8, 2017. “MRSA Infection,” Mayo Clinic; http://www.mayoclinic.org/diseases-conditions/mrsa/basics/definition/con-20024479, last accessed March 8, 2017.